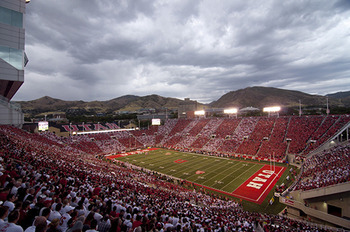 SALT LAKE CITY—The University of Utah recently updated its Rice-Eccles Stadium with a complete audio system from HARMAN Professional Solutions. Dallas-based sound and visual consultant WJHW was hired to design the new system, and local systems integrator Performance Audio provided installation services. The university wanted to replace its old point source sound system to reduce community noise impact in nearby residential areas and provide a better audio experience for audiences. To meet these goals, WJHW designed an innovative distributed audio solution made up of JBL speakers, Crown power amplifiers and BSS Audio networked audio systems. Rice-Eccles is a large, single-bowl stadium with nowhere to hang speakers other than six light towers. WJHW developed a concept that involved adding 17 50-foot speaker poles around the upper rim of the stadium to mount the loudspeakers. Weight and wind were major concerns from a structural engineering standpoint, and they wanted to use the smallest speakers possible while still delivering the required output. WJHW system designer Michael Murph selected new JBL Precision Directivity Series PD743i-215 speakers for their compact size and full-bandwidth output. For the light towers, they selected JBL Variable Line Array (VLA) Series loudspeakers. The entire system is powered by Crown DriveCore Install Series amplifiers. Once the speakers were installed, Performance Audio and WJHW spent three days adjusting the DSP, and tuning and balancing the massive system. The audio teams were up against a tight deadline to complete the project—the university needed the entire system ready in time to host the 2016 Nitro World games, a major action sports competition. To complicate the process even further, they had to work in the middle of the night to avoid interfering with a municipal train line that runs behind the stadium. By working with HARMAN Professional Solutions, Performance Audio and WJHW were able to streamline the entire installation process, quickly deal with any unexpected challenges and complete the project on schedule.